Most people are familiar with the health benefits of tea, due to its antioxidant properties. Red tea, however, may not be as widely heard of or used. This red tea, also known as "rooibos," has a host of benefits, including immune system health and aiding with common aches and pains. Stomach cramps, headaches, allergies, asthma, insomnia, eczema and high blood pressure are some of the ailments that could be helped with red tea. In addition, according to the U.S. Department of Agriculture, flavonoid-rich foods including fruits, vegetables, red wine, chocolate and tea have cardiovascular benefits. 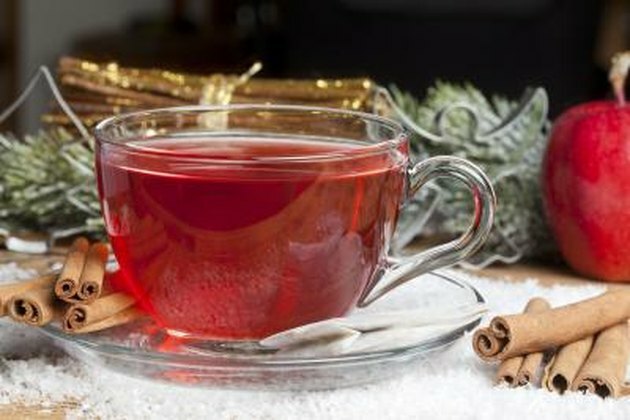 Red tea is an ideal beverage, as it can be sipped hot or cold. Cold red tea is refreshing, while hot red tea is soothing. The absence of caffeine in red tea makes it a wonderful bed-time beverage that can aid those with insomnia and calm an irritated throat. Cold red tea can quench summer thirst while offering the benefits of hydration and antioxidants, which are known to slow aging and boost the immune system for greater protection against colds and/or illnesses. Most individuals are aware of the body's need for calcium and the importance of strong bones for both growing children and aging adults. While milk and dairy products are rich sources of calcium, red tea may also be included as a source of calcium. Those who are lactose intolerant -- have difficulty digesting dairy -- may find red tea a refreshing alternative that is both easy to digest and good for the stomach. What Are the Benefits of Red Zinger Tea?